What is a clamp meter and what can it do? What measurements can be made with a clamp meter? How do you get the most out of a clamp meter? Which clamp meter is best suited to the environment the meter will be used in? The answers to these questions will be found in this application note. 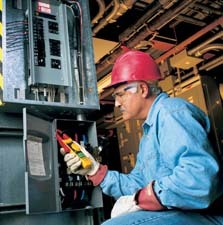 With technological advances in electrical equipment and circuits come more challenges for electricians and technicians. These advances not only require more capability in today's test equipment, but more skills on the part of the people who use them. An electrician who has a good grounding in the fundamentals of test equipment use will be better prepared for today's testing and troubleshooting challenges. The clamp meter is one such important and common tool found in the toolboxes of electricians and technicians alike. A clamp meter is an electrical tester that combines a voltmeter with a clamp type current meter. Like the multimeter, the clamp meter has passed through the analog period and into the digital world of today. Created primarily as a single purpose test tool for electricians, today's models have incorporated more measurement functions, more accuracy, and in some instruments, some very special measurement features. 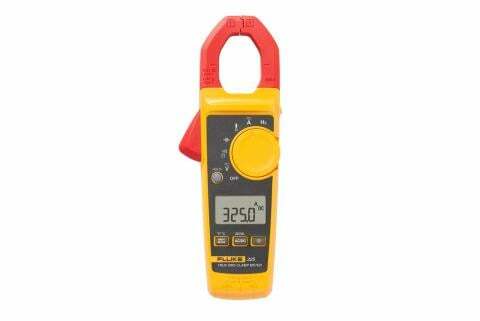 Today's clamp meters many of the basic functions of a Digital Multimeter (DMM), but with the added feature of a current transformer built into the product. The ability of clamp meters to measure large ac currents is based on simple transformer action. When you clamp the instrument's "jaws" around a conductor carrying ac current, that current is coupled through the jaws, similar to the iron core of a power transformer and into a secondary winding which is connected across the shunt of the meter's input. A much smaller current is delivered to the meter's input due to the ratio of the number of secondary windings vs. the number of primary windings wrapped around the core. Usually, the primary is represented by the one conductor around which the jaws are clamped. If the secondary has 1000 windings, then the secondary current is 1/1000 the current flowing in the primary, or in this case the conductor being measured. Thus, 1 amp of current in the conductor being measured would produce 0.001 amps or 1 milliamp of current at the input of the meter. With this technique, much larger currents can be easily measured by increasing the number of turns in the secondary. Buying a clamp meter not only requires looking at specifications, but also looking at features, functions, and the overall value represented by a meter's design and the care taken in its production. 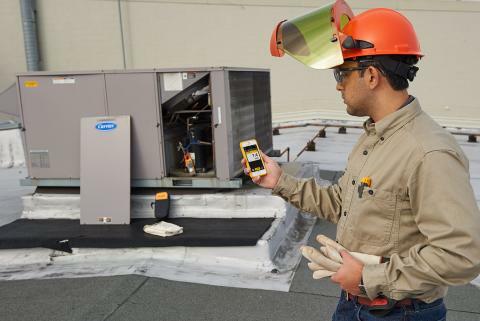 Reliability, especially under tough conditions, is more important than ever today. Fluke's design engineers make a point of building these test tools not only electrically robust, but mechanically as well. 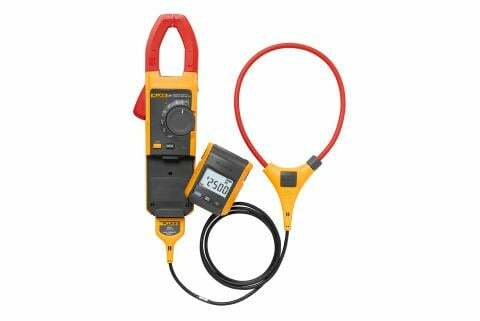 By the time Fluke clamp meters are ready to be tossed into toolcases, they've undergone a rigorous testing and evaluation program. User safety should be a primary consideration in choosing a clamp meter or any other piece of electrical test equipment. 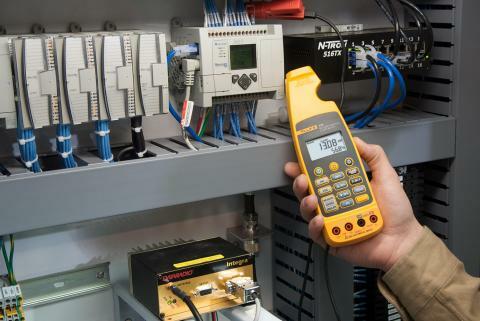 Fluke not only designs their clamp meters to the latest electrical standards, but each are independently tested and then listed by certified testing labs such as UL, CSA, VDE, etc. Only with these certifications can you be assured an electrical tester meets these new safety standards. Resolution refers to how fine a measurement a meter can make. By knowing the resolution of a meter, you can determine if it's possible to see a small change in the measured signal. For example, if the clamp meter has a resolution of 0.1 amp on a 600 amp range, it's possible to see a change of 0.1 amp while reading 100 amps. You wouldn't buy a ruler marked in one-inch segments if you had to measure down to ¼ inch. Similarly, you must choose a meter that can display the resolution you need to see in your measurements. Accuracy is the largest allowable error that will occur under specific operating conditions. In other words, it is an indication of how close the meter's displayed measurement is to the actual value of the signal being measured. Accuracy for a clamp meter is usually expressed as a percent of reading. An accuracy of 1% of reading means that for a displayed reading of 100 amps, the actual value of the current could be anywhere between 99.0 and 101.0 amps. Specifications may also include a range of digits added to the basic accuracy specification. This indicates how many counts the digit to the extreme right of the display may vary. So the preceding accuracy example might be stated as ±(2% + 2). Therefore, for a displayed reading of 100.0 amps, the actual current could then be estimate to be between 97.8 and 102.2 amps. With the growth of electronic power supplies, the currents drawn from today's electrical distribution system are no longer pure 60 or 50 cycle sine waves. These currents have become fairly distorted, due to the harmonic content these power supplies generate. However, electrical power system components such as fuses, bus bars, conductors, and thermal elements of circuit breakers are rated in rms current because their main limitation has to do with heat dissipation. If we want to check an electrical circuit for overloading, we need to measure the rms current and compare the measured value to the rated value for the component in question. Therefore, today's test equipment must be able to accurately measure the True-rms value of a signal regardless of how distorted the signal may be. Crest factor is a simple ratio of a signal's peak value to its rms value. For a pure ac sine wave, the crest factor would be 1:1.414. However, a signal that has a very sharp pulse would cause the ratio, or crest factor, to be high. Depending on the width of the pulse and its frequency, you can see crest factors of 10:1 or higher. In real power distribution systems, crest factors of greater than 3:1 are rarely seen. So as you can see, crest factor is an indication of a signal's distortion. A crest factor specification will be found only in specifications for meters that can make True-rms measurements. It indicates how much distortion a signal can have and still be measured within the meter's accuracy specification. Most true-rms reading clamp meters have crest factor specifications of 2:1 or 3:1. That will handle most electrical applications. One of the most basic measurements of a clamp meter is ac current. Typical ac current measurements are taken on various branch circuits of an electrical distribution system. Determining how much current is flowing in various branch circuits is a fairly common task for the electrician. By taking current measurements along the run of a branch circuit, you can easily tell how much each load along the branch circuit is drawing from the distribution system. When a circuit breaker or transformer appears to be overheating, it's best to take a current measurement on the branch circuit to determine the load current. However, make sure you are using a True-rms responding meter so you can get an accurate measurement of the signal heating up these components. The average responding meter will not give a true reading if the current and voltage are non-sinusoidal due to non-linear loads. Another common function for a clamp meter is measuring voltage. Today's clamp meters are capable of measuring both ac and dc voltage. AC voltage is usually created by a generator and then distributed through an electrical distribution system. 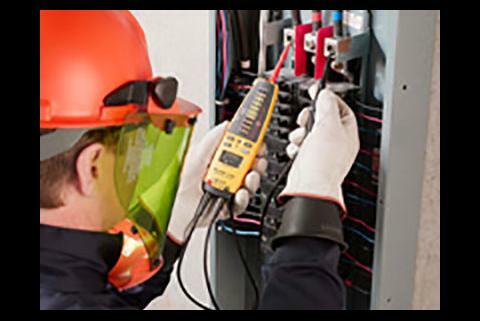 An electrician's job is to be able to take measurements throughout the system to isolate and fix electrical problems. Another common voltage measurement would be testing battery voltage. In this case, you would be measuring direct current or dc voltage. Testing for proper supply voltage is usually the first thing measured when troubleshooting a circuit. If there is no voltage present, or if it is too high or too low, the voltage problem should be corrected before investigating further. A clamp meter's ability to measure ac voltage can be effected by the frequency of the signal. 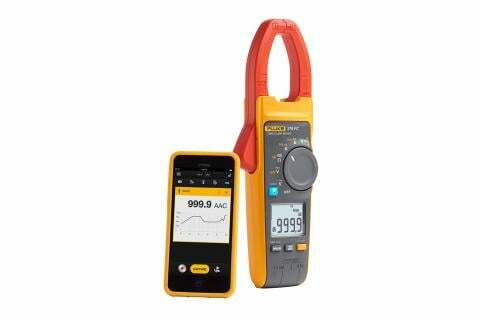 Most clamp meters can accurately measure ac voltages with frequencies from 50 Hz to 500 Hz, but a digital multimeter's ac measurement bandwidth may be 100 kHz or higher. This is why the reading of the same voltage by a clamp meter and digital multimeter can have very different results. The digital multimeter allows more of the high frequency voltage through to the measurement circuitry, while the clamp meter filters out some of the voltage contained in the signal above the bandwidth of the meter. When troubleshooting variable speed drives (VSD), the input bandwidth of a meter can become very important toward getting a meaningful reading. Due to the high harmonic content in the signal coming out of a VSD to the motor, a DMM would measure most of the voltage content depending on its input bandwidth. Measuring the voltage output of a VSD is not a common measurement; if you did the reading would be higher. A motor connected to a VSD only responds to the average value of the signal, and to measure that power, the input bandwidth of the meter must be narrower than its DMM counterpart. The Fluke 337 Clamp Meter has been specifically designed for testing and troubleshooting VSDs. Select Volts AC (V~) or Volts DC (V ), as desired. Plug the black test probe into the COM input jack. Plug the red test probe into the V input jack. Touch the probe tips to the circuit across a load or power source (in parallel to the circuit). View the reading, being sure to note the unit of measurement. (Optional) Press the HOLD button to freeze the reading in the display. Now you can remove the meter from the live circuit and then read the display when you are safely clear of the electrical hazard. By taking a voltage measurement at the circuit breaker and then at the input of the load on that breaker, you can determine the voltage drop that occurs across the wires connecting them. A significant drop in voltage at the load may effect how well the load functions. Resistance is measured in ohms (O). Resistance values can vary greatly, from a few miliohms (mO) for contact resistance to billions of ohms for insulators. Most clamp meters measure down to 0.1?. When the measured resistance is higher than the upper limit of the meter, or the circuit is open, "OL" appears in the meter's display. Resistance measurements must be made with the circuit power off - otherwise, the meter or circuit could be damaged. Some clamp meters provide protection in the ohms mode in case of accidental contact with voltages. The level of protection may vary greatly among different clamp meter models. A very common electrical resistance measurement is reading the resistance of a contactor coil. Continuity is a quick go/no-go resistance test that distinguishes between an open and a closed circuit. A clamp meter with a continuity beeper allows you to complete many continuity tests easily and quickly. The meter beeps when it detects a closed circuit, so you don't have to look at the meter as you test. The level of resistance required to trigger the beeper varies from meter to meter. Typical resistance setting to turn on the beeper is a reading less than between 20 and 40 ohms. A fairly common measurement function is reading the frequency of an ac current waveform. With the clamp meter's jaws wrapped around a conductor carrying ac current, switch on the Frequency function and the meter's display will indicate the frequency of the signal flowing in the conductor. This is a very helpful measurement when tracking down harmonic problems in an electrical distribution system. Another feature that can be found in some clamp meter models is MIN MAX storage. 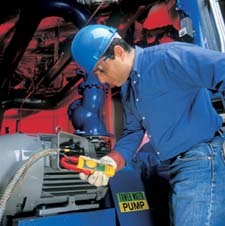 When this feature is activated, each reading the clamp meter takes is compared against any previously stored readings. If the new reading is higher than the reading in the high reading memory, it replaces that reading as the highest reading. The same comparison is made against the low reading memory and replaces it if it is lower than the stored reading. As long as the MIN MAX feature is active, all readings are processed in this way. Thus, after a period of time, you can call up each of these memory values to the display and determine the highest and lowest reading over some period of time. For electricians who deal with motors in their work, the ability to capture the amount of current drawn by a motor during its start up, can tell a lot about a motor's condition and loading. The Fluke 335, 336 and 337 Clamp Meters incorporate "in-rush" current measurement as part of their feature sets. After clamping the jaws around one of the motors input leads, activate the "in-rush" mode. Next, turn on the motor. The clamp meter's display will indicate the maximum current drawn by the motor over the first 100 milliseconds of its start cycle. Making measurements safely starts with choosing the proper meter for the environment in which the meter will be used. Once the proper meter has been chosen, you should use it by following good measurement procedures. The International Electrotechnical Commission established new safety standards for working on electrical systems. Make sure you are using a meter that meets the IEC category and voltage rating approved for the environment where the measurement is to be made. For instance, if a voltage measurement needs to be made in an electrical panel with 480V, then a meter rated Category III - 600 V should be used. This means the input circuitry of the meter has been designed to withstand voltage transients commonly found in this environment without harming the user.Choosing a meter with this rating which also has a UL, CSA, VDE or TUV certification means the meter not only has been designed to IEC standards but has been independantly tested and meets those standards¹. (See independent testing). The following special features and functions may make it easier to use your clamp meter. Autoranging automatically selects proper measurement range. Manual ranging lets you lock into a specific range for repetitive measurements. How can you tell if you're getting a genuine CAT III or CAT II meter? Unfortunately it's not always that easy. It is possible for a manufacturer to self-certify its meters as CAT II or CAT III without any independent verification. Beware of wording such as "Designed to meet specification…" Designer's plans are never a substitute for an actual independent test. The IEC (International Electrotechnical Commission) develops and proposes standards, but it is not responsible for enforcing the standards. Look for the symbol and listing number of an independent testing lab such as UL, CSA, TÜV or other recognized approval agency. That symbol can only be used if the product successfully completed testing to the agency's standard, which is based on national/international standards. UL 3111, for example, is based on IEC 1010. In an imperfect world, that is the closest you can come to ensuring that the multimeter you choose was actually tested for safety. Warning: Meter ratings and capabilities vary by manufacturer. Before working with a new meter, be sure to familiarize yourself with all operating and safety procedures for that meter contained in the users manual. Accuracy. How close the displayed measurement is to the actual value of the signal being measured. Expressed as a percentage of reading or a as a percentage of full scale. Analog meter. An instrument that uses a needle movement to display the value of a measured signal. The user judges the reading based in the position of the needle on a scale. Annuciator. A symbol or icon that identifies a selected range or a function. Average responding meter. A meter that accurately measures sinusoidal waveforms, while measuring non-sinusoidal waveforms with less accuracy. Non-Sinudoidal waveform. A distorted waveform such as a pulse train, square waves, triangular waves, sawtooth waves and spikes. Resolution. The degree to which small changes in a measurement can be displayed. RMS. The equivalent dc value of an ac waveform. Sinusoidal waveform. A pure sine wave without distortion. True-rms meter. A meter that can accurately measure both sinusoidal and non-sinusoidal waveforms. 1 See the ABCs of Multimeter Safety to learn more about IEC-1010 and how it applies to multimeter use.